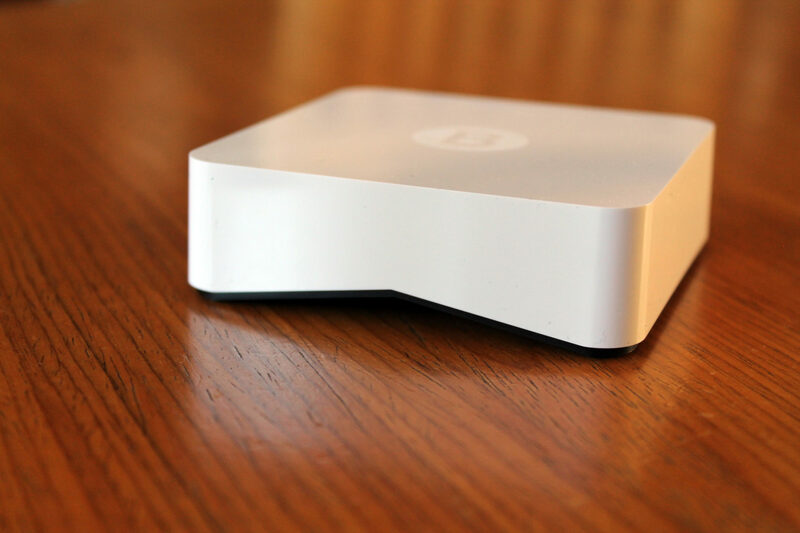 Today we will be taking a look at an exclusive bit of home network based security equipment to keep you safe while online in the comfort of your armchair, the Bitdefender Security Box. For years, PC and technology enthusiasts have always had a lurking enemy that has developed as we have, that being viruses and other malicious applications. With it becoming more and more difficult to defend as our platforms develop and the way we use technology, we often find ourselves using different software packages on different devices to repel any unwanted bugs. Luckily, Bitdefender has come to the rescue and released a very cool device which assists with scanning your home network based devices for any potential threats to security. 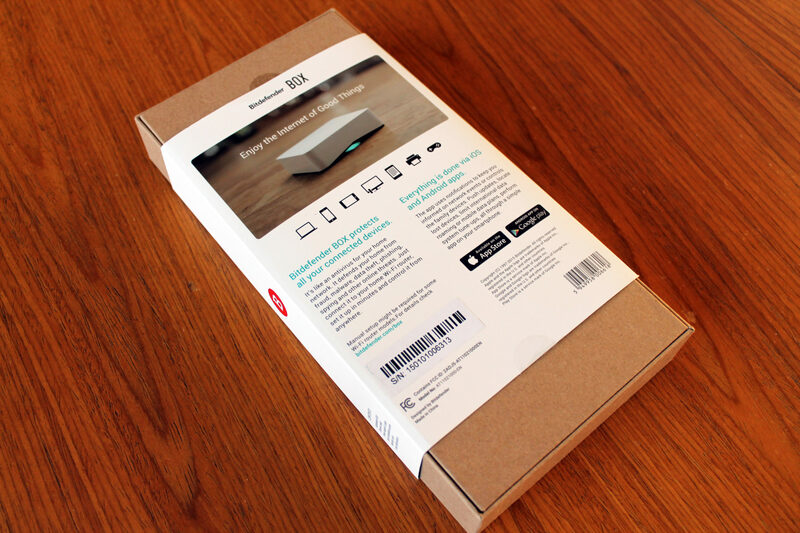 Moving back on to the product at hand, the Bitdefender Box costs $129 and comes with one free year of service. After that, protection costs $99 a year for an unlimited number of devices. This isn’t such a bad deal, with it in mind that the Bitdefender Total Security covers only three devices and the Box allows for full coverage on all of your devices within the year service. 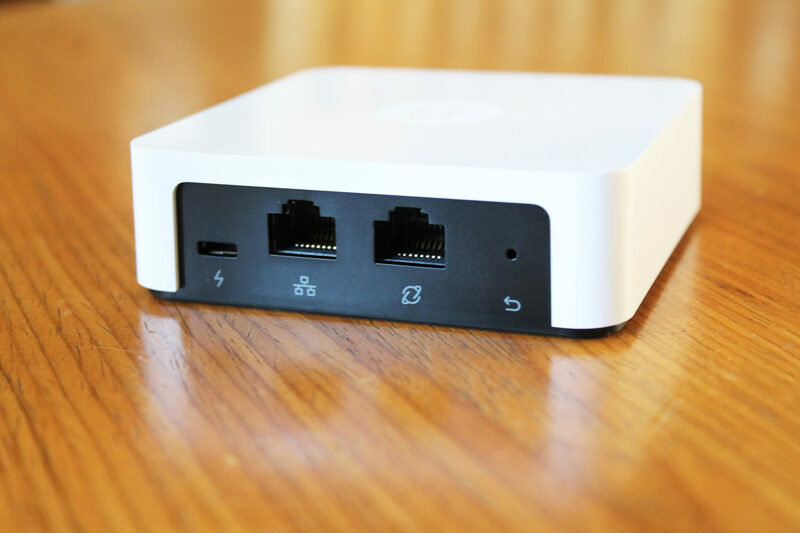 Once you begin to think about how many devices connect to your Wi-Fi network on a day to day basis, the Box quickly starts to look like a very good deal. With this information in mind and the capabilities of this simplistic little box very much clear, we can progress our review and see what all the fuss is about. Information on the Bitdefender Box can be located lower down on this page here, under the heading “Box Tech Details” but we have included them in this segment for your ease of use. 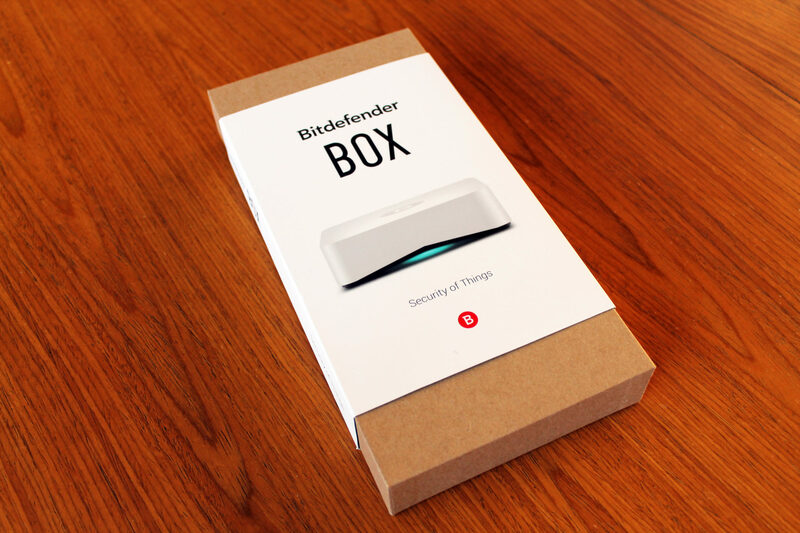 Now we will take a closer look at the Bitdefender box in its natural, simplistic beauty and what is included in the box. The outer packaging is very basic with a sturdy cardboard body and card sleeve with all the details you need to be able to identify what the product is on the front. On the back, we have a more detailed description of the product and the capabilities it has. Compatibility is also listed, although vague but gives you a good indication as to what you can use the Bitdefender box to protect. 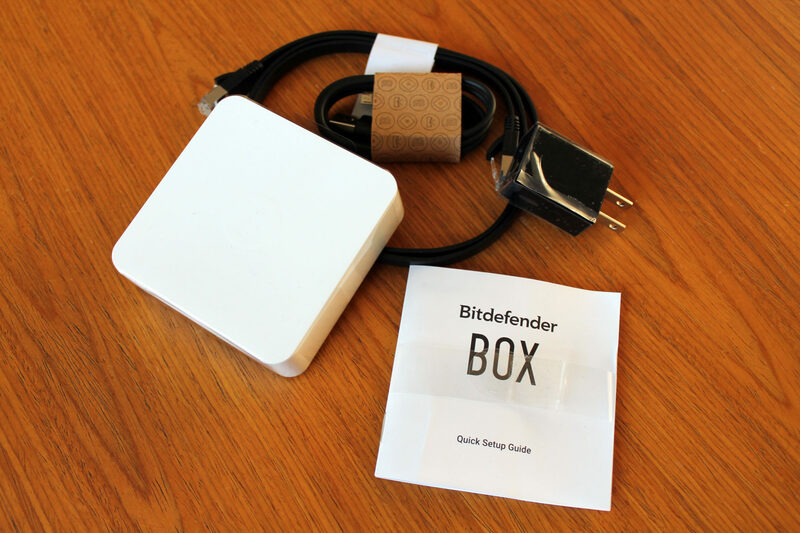 In the box, we have the traditional manual with warranty information and set up details, a USB cable with wall plug, a flat line ethernet cable and finally, the Bitdefender Box. The box itself, with the dimensions of 3.5 x 3.5 x 1.1 in and a total weight of 3.24 oz. / 92 g is very modern yet simplistic. The white gloss finish, covering the whole unit, does draw dust but not enough to spoil the visual representation that stands as being the security you could ever need in one little bundle. 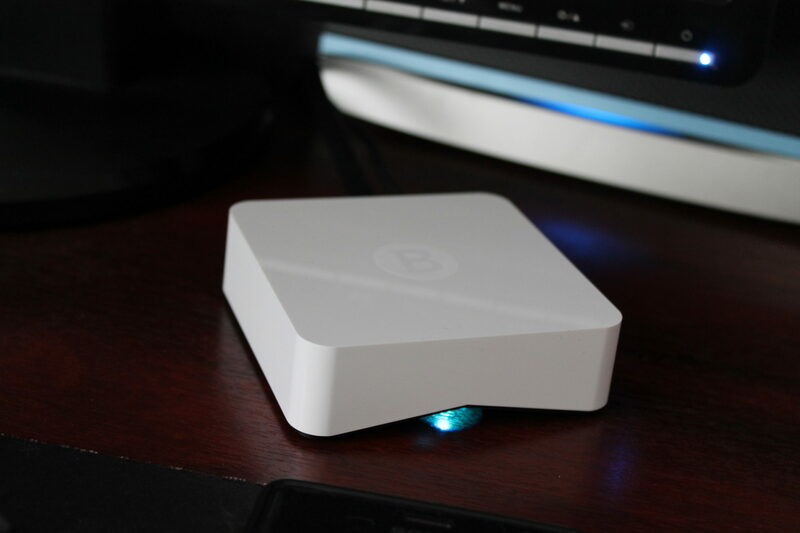 A matt finish “B”, representing the Bitdefender logo, is featured on the top of the box but is very hard to see when lighting is minimal. The rear IO features just what you need, a charging port in the shape of a Micro USB, reset switch, gigabit ethernet passthrough and connectivity port. Following the easy “how to” guide, set up is a breeze with almost no effort needed. For reference, we will go through the basic step by step process for setting up the box so you know how our test configuration was created. After plugging in the powered USB and network cable into the Bitdefender box, the correlating opposite ends of each cable going to their rightful place, I was greeted with a pleasant blue light to show that the box was operational. 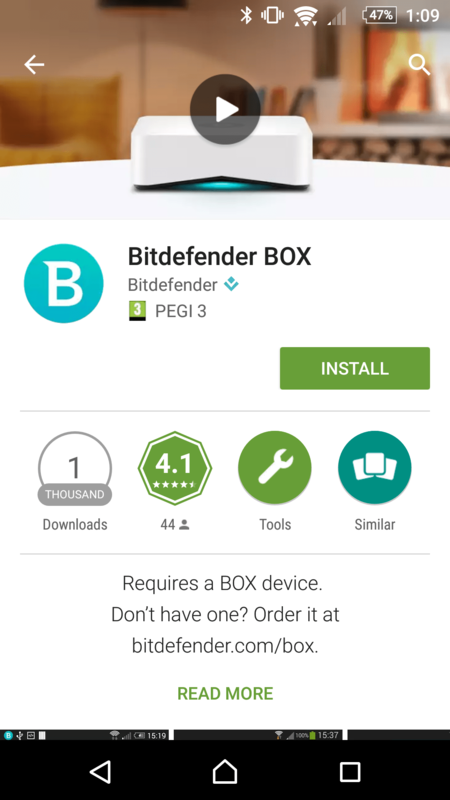 From there, we headed over to the Google App Market and located the relevant application needed to set up the Bitdefender Box. For Apple users, follow the same process but for iTunes/App Store. Searching “Bitdefender BOX” will pull up the correct app, so we downloaded and a few moments later were faced with a logon page. Setting up an account will then allow you to make use of the year-long free subscription provided with the box by Bitdefender. 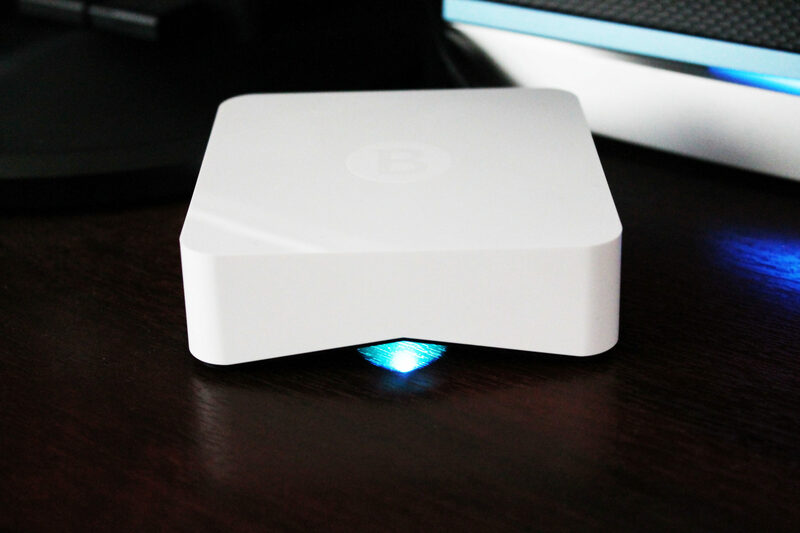 From there, the Bitdefender Box will automatically set itself up on the network and alert you that it is working. We did face a small issue, this being that we had to set our DCHP server to off in order for the Bitdefender box to work but this was very simple to do. For those of you out there, this may be the most difficult step if using an older router or you are not very technically minded, but also the easiest if the Bitdefender Box sets itself up without any kind of user input. If at this stage you do require assistance, Bitdefender has an online support page to help you. 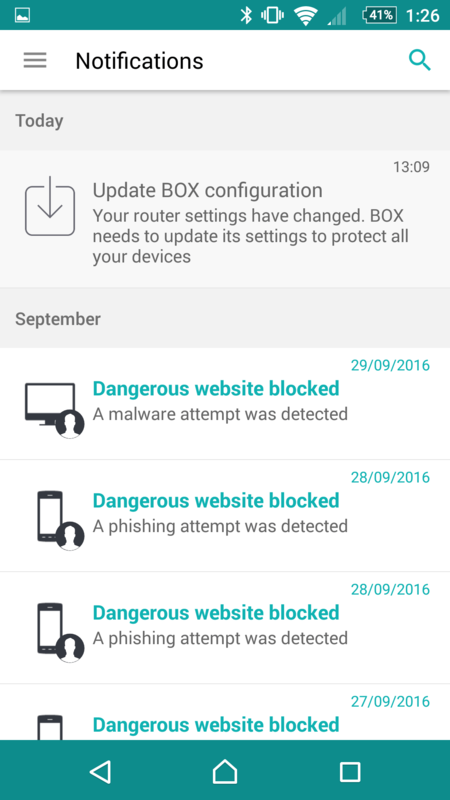 Now that the Bitdefender Box is set up, we have the software installed and configured on our device we can now see what it has on offer. 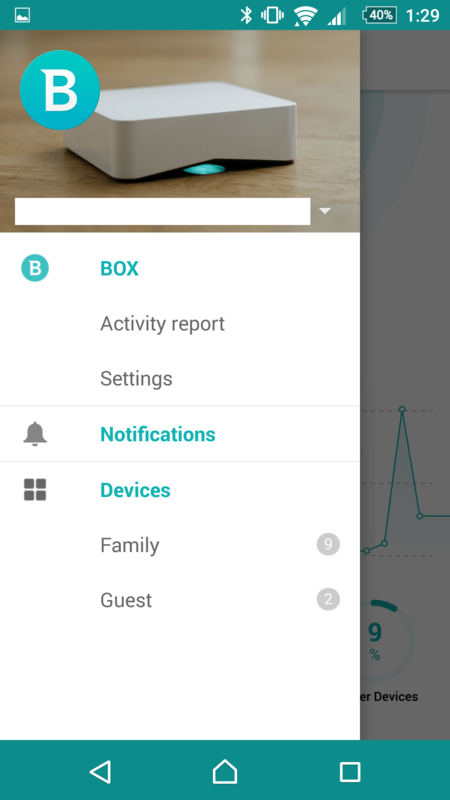 The menu, located on the left of the screen, gives you access to everything you need to administrate and monitor what the box does with additional settings to make your experience much easier. Under the box heading, we can see an activity report that includes details of which users are generating the most traffic, how much traffic has been monitored and the usual figures like dates and times. This is very useful to see what users are heavy footed when it comes to using bandwidth and potentially generating the most warnings throughout their browsing time. Additionally, settings for the Bitdefender Box can be found in this section of the menu. Information like the firmware version and software updates can be found here. Under the “notification” tab of the menu, we can see the unwanted malware and phishing sites / content blocked by the Bitdefender Box. Organised in a basic list format with information provided on the user and what was blocked, we get a gist as to what the Bitdefender Box was made for: Protection. 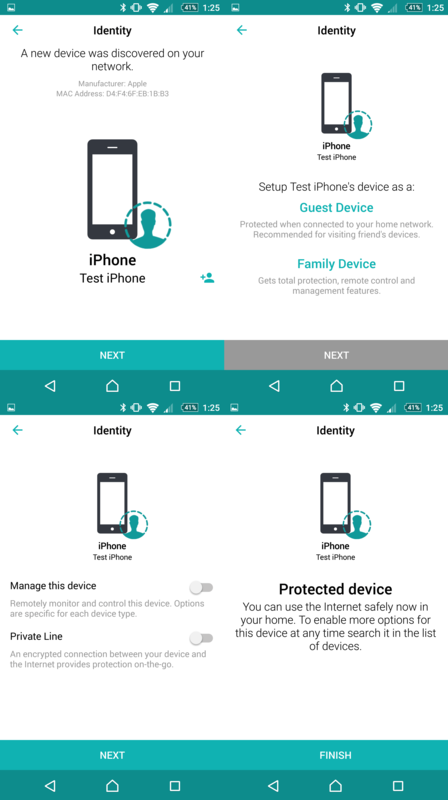 Under the “Devices” section of the Bitdefender Box software/app, we have the general administrational features that allow you to control and administer users on the network through the box. In this section, we have two different features. One, accessible once under the “guests” tab, is the ability to add new devices to the Bitdefender Box security net and configure the devices so that they are protected, even when away from your home Wi-Fi. Once you have selected a device, you can add an image and name to it in order to allow for easier identification of each device on your network. From there, you can format the devices security access by choosing between “Guest Device” and “Family Device”, each having their own access plan to Bitdefenders Security. 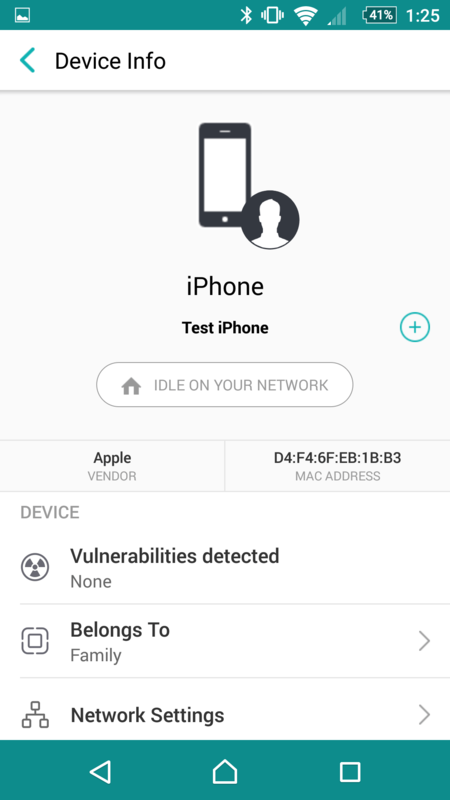 The next screen also allows you to administrate the abilities, especially on mobile phones, that the Bitdefender Box and how this device can be accessed. From being able to remote control the device if stolen to setting up security applications on the phone to ensure it stays safe on the web, everything has been thought through. Finally, we have the finish screen with all of your configuration details displayed. Once you have configured devices to suit your needs, you will be able to look at what you have connected and even idle, have the capabilities to amend or correct what you have done. 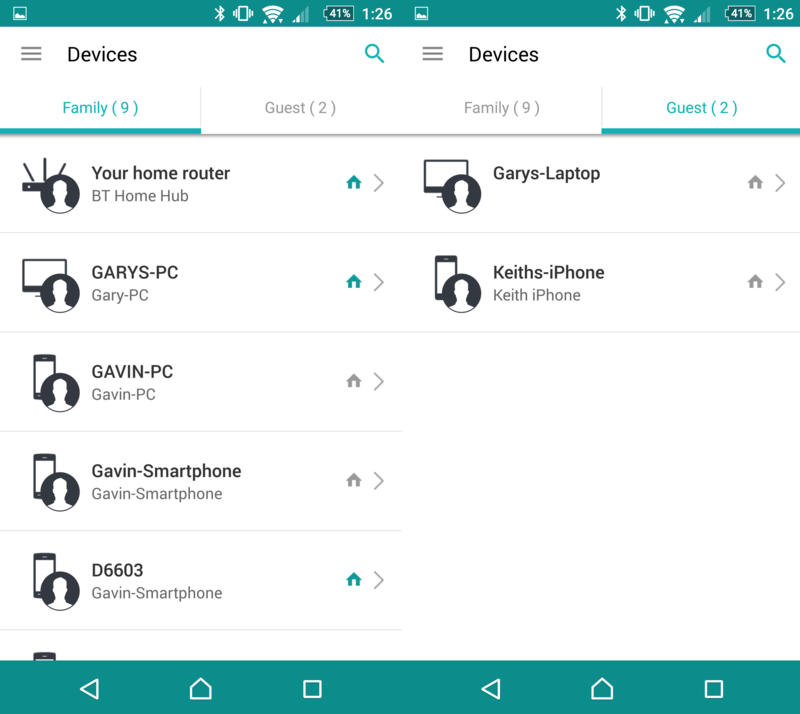 The easy set list shows Family devices and Guest devices, by default all unknown devices you have not set up will be placed on the Guest list. Be sure to keep up to date with the administration of your devices so that they stay accessible while using the Bitdefender App. A final note is the capabilities you have over devices set up with all permissions integrated. The user will receive notification from your Bitdefender Box that you need to download the relevant application, otherwise prompted once attempting to access the internet through a browser. Once downloaded, the fields you see in this screenprint become active and allow you to control the device or whatever is accomplishable from the device administration screen you see here. This control is great if your device is lost or stolen, plus the application doubles up as a security agent thus not allowing malicious files from being downloaded to your phone while on the go. With experience using the Bitdefender box and software for a solid month, it is time to evaluate the overall product and see if it justifies the price tag for what is simply, home internet / device security available through software packages. The box comes with everything you need to get started for a solid price of $129, $29 more than the highest costing software package for anti-virus by Bitdefender but with one benefit, unlimited device registration compared to the 3 device limit of the standalone software. if that does not scream “BUY ME” for those of you looking for quality protection from modern-day cyber threats then I am not sure what is wrong with you. But if you are not sold on the idea yet, let me carry on and tell you a little more. Within a month, I had 21 malicious files detected and 50+ pop-up websites blocked thanks to this handy device, that was from around 12 devices over the duration. The process for being alerted was very simple, just a buzz in my pocket to fill me in on what this smart little box had done. It is handy to know what you are browsing is, although seemingly safe, littered with bugs and viruses, so that you can redirect your viewing to a more secure website. No crude pop-ups, no red screens that seem to scream at you to warn you of potential dangers, just a well-structured notification that gives you all the information needed. Set up and configuration is very easy with help available through support analysts at Bitdefender. Administration, although easy to do and very clean cut, does seem to be lacking in a few departments. This is the only downside I can see, aside from the Bitdefender being a terrible alternative for replacing your router with, are some lack in web interface and little details that would make usage much clearer through the app. The name system, a typical example, is a tad annoying. Yes, I can see that the device is a iPhone but there is no need to tell me EVERYWHERE after I did change the name. It is the little things that let the app down, although very basic, it is too basic and a little frustrating. Push this aside and be more patient than me and I am sure many of you can look past this. Overall, aside from being a great product for the price and packing a punch in the protection department, I was amazed that the Bitdefender offered so much in a little bundle and pieced everything together in a tidy interface even Aperture Science Labs would be happy with! 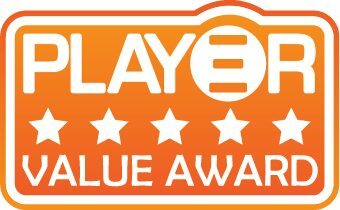 With this said, I would like to award the Bitdefender Security Box our “Value” award for a great priced security at your finger tips and a “Recommended” award for our recommendations that you get hooked up with this awesome device!